Sitma – an Italian company specialized in the designing and building of solutions, machines, and whole production lines for the Packaging, Post-Press, DM/Transpromo and E-Logistics industries – will be showing a new machine for the wrapping of frozen pizzas and bakery products at the next edition of the IPACK-IMA trade fair in Milan. Developed in response to the growing requests of the frozen food industry, the new Sitma 8002 is based on the 790, one of the most appreciated solutions on the market, and it follows that machine construction principles, setting new standards for production performance. Ergonomics and modularity as construction principles. Sitma 8002 is the innovative solution developed by the company based in Spilamberto (MO) for the wrapping of pizzas and other frozen foods, with a speed of up to 9.000 products/hour. With best in class production performances, that combine with an ergonomic and modular stainless steel construction – which is in line with hygienic design requirements – the machine is capable of assuring easy access while also allowing for simple in line connection with other production systems. Sitma 8002 can be equipped with a shrinking tunnel, which is also fully made of stainless steel and is fitted with an opening shrink tunnel, designed in a way that enables easier cleaning and maintenance operations, and with an independent control panel, to simplify the setup of the different parameters. The feeding system consists of a sequence of conveyor belts that receive the products from the freezer and allow them to be ordered in a regular manner to be prepared for the wrapping stage. Thanks to the synchronization logic between the feeding and the wrapping speed, it’s possible to avoid contacts and overlap between products, with a steady rhythm that allows for the optimization of production capacity. Innovative packaging for companies and the end consumer. The overwrapping and secondary packaging stages have also been carefully studied, given the strong correlation between these and the communication strategies of the client’s brand, the shelf placement and the material saving. 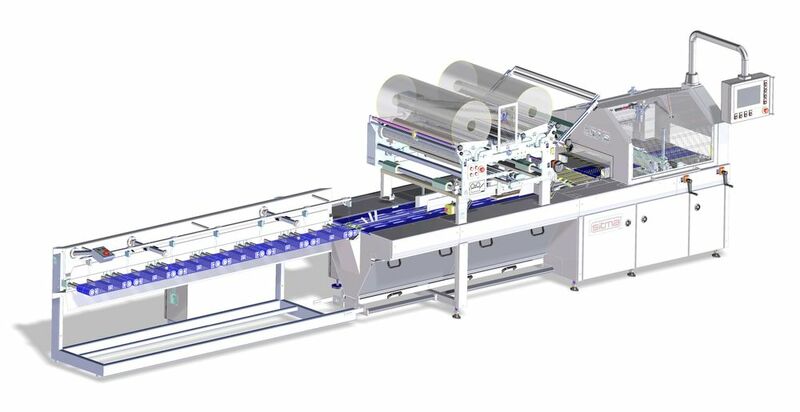 The primary packaging line Sitma 8002 can be connected to a pizza cartoning machine and, after that, an end-of-line system for the stacking of cartons and the packaging of the piles. Compared to the previous series, one of the main innovations in Sitma 8002 is the option of wrapping pizzas directly inside a special multilayer film, getting rid of the cartoning stage, thanks to a special air welder. Another innovative feature that makes Sitma 8002 truly unique is the option of welding in a lateral position, which enables the packaging surface to be kept clean and easily readable, to allow for better branding and communication. Thanks to this system, the weight and volume of the packaging can also be reduced, which can lead to significant savings for the end customer. This is because such characteristics enable the streamlining of the product’s distribution and storage throughout the supply chain. Finally, the end user can also benefit in all phases from transportation to freezer storage, up to the packaging disposal stage.